Old world feel with modern conveniences. A gas stove is a great way to cut down on winter electricity bills, while making a visually-appealing statement in your house. Add a little old world with the Monterey Gas Stove. The solid steel design mixed with the steel lattice grating on the front are reminiscent of cast iron wood burning stoves of old. The large faux charred logs give the appearance of being ignited by the beautiful and soothing yellow flame. The large open face design allows for optimal viewing. Also, it provides that fantastic soft glow around any room it's placed in. Kozy World has worked all the modern conveniences into this stunning stove, but left them hidden to keep up the illusion. This stove is vent-free and will heat a room up to 1,250 sq. ft. The included thermostat allows you to set the perfect temperature and walk away. No need to continuously adjust it. And with a safety electronic ignition, you don't have to sit there and futz with getting it lit for hours, like a wood fire. The internal gas flow regulator keeps it working smoothly, while making sure it always maintains and appropriate pressure. All the feel of the old world, with the latest modern conveniences. Either! We understand that some people prefer propane, while others prefer the use of natural gas inside their house. Kozy World has heard you, and has given you the option of either with this gas stove. 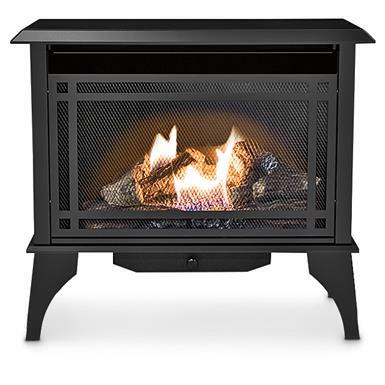 So whether you use it up at your cabin with a propane tank or at home hooked directly into your natural gas line, it'll keep you warm while providing the appearance of an old time wood burning stove. Now, you can have style and substance. Measures 31.93" x 14.37" x 28.27"h.